This was, Ambassador Barzun said , his 66th such visit and our responses were very much in line with his experiences elsewhere. 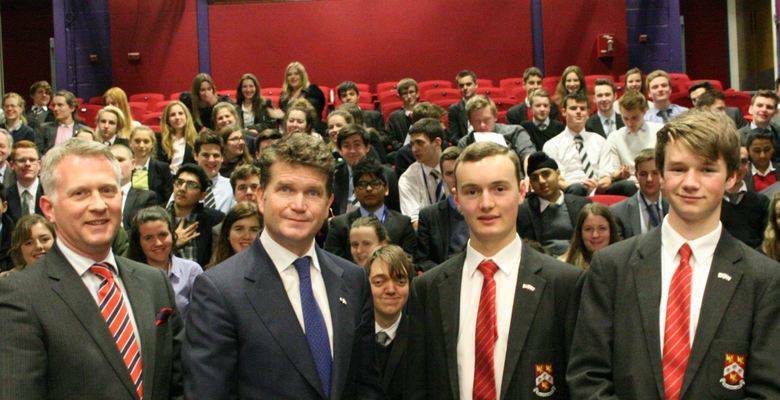 Ambassador Barzun’s approach was innovative and collaborative - a conversation rather than a simple lecture. Students were equipped with electronic key-pads to enable them to answer a series of questions about their perceptions of America and its role in world affairs as the starting point for further discussion. The second part of the presentation involved the students drawing or writing briefly on cards, one side for the things that frustrated, concerned or confused them about the USA, and the other for things that they liked, admired or found inspiring. Predictably, gun control figured largely on the former, and Mr Barzun delivered a fascinating discourse on the importance of guns to the mythology and culture of his country and its historical roots. He also expounded on the importance and value of American involvement in foreign affairs, pointing out that this was not just military but financial and humanitarian as well. On the positive side of the cards, music, film and television, food, opportunity and optimism all figured largely. This was, Ambassador Barzun said , his 66th such visit and our responses were very much in line with his experiences elsewhere. Such interaction was vital in helping form a view of how his country and its relationship with the UK were perceived. It was very much a learning process for both sides, he felt. After the presentation, the ambassador presented commemorative coins to Matthew Pugh and Oliver Cole (both Fifth Year), who had won the award for best team in the Benjamin Franklin Debating Competition last year. Our thanks to Ambassador Barzun for his fascinating exploration of American thought and values, to his team for their co-operation in making the visit possible and to Mrs Packer for organising the event. We may be divided by more than a common language, as Shaw had it, but the relationship between our countries is clearly as special as ever.